The Canadian Quilters Association Quilts for Valour is asking for log cabin blocks. Please read the following. I would like to put a challenge out to the guild and see how many blocks we can make and send them to Ottawa. They need 48 blocks for each quilt. If you are not interested in the challenge but have scraps of yellow, red or white fabric that you could donate it would be greatly appreciated. Click on the link below for the block pattern. Quilts of Valour will be celebrating its ten year anniversary as a nonprofit society in 2019. QOVC is hoping you will help us celebrate by making log cabin blocks /or finished quilts for our injured military members. The block is an unfinished 10 1/2 inch log cabin block made in reds and whites representing Canada with a yellow centre representing a light in the window/welcome home. Click here for the block pattern. Quilts of Valour will have a larger booth than normal at Quilt Canada 2019, thanks to the generosity of the Canadian Quilters’ Association (CQA/ACC). We will be inviting a number of distinguished and celebrity guests from the Ottawa area to sew pre-cut log cabin blocks at the booth; each guest will have a sewing coach to help with the block. Drop by our booth at Quilt Canada 2019 to encourage our guests as they try their hand at this art form. Quilts of Valour thanks you for your support! 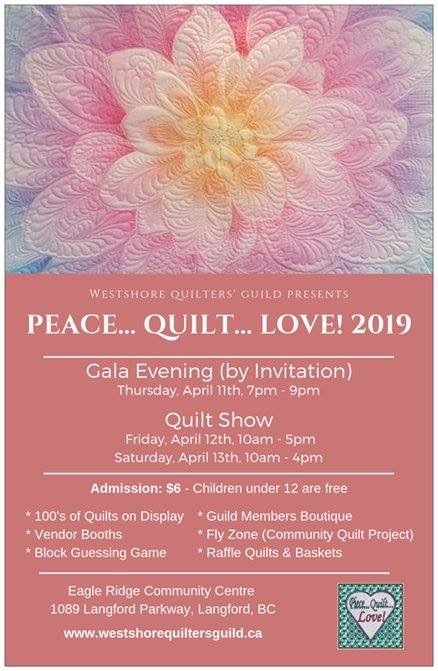 CQA Event Calendar – Quilt Show Listings, etc. American Event Calendar – Quilt Show Listings, etc.